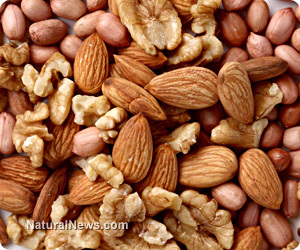 (NaturalNews) You may think that scientific validation of daily raw nut consumption lowering your risk of death from all causes by a whopping 20 percent would send a shock wave throughout the medical community and produce headlines on every major network TV channel and online information portal. Reports of this finding barely scratched the surface of the news bubble, though this important information could easily affect the lives of every man, woman and child around the globe and extend the natural lifespan of millions each year. If nuts were classified as a grossly overpriced pharmaceutical, there would undoubtedly be a wave of television commercials, media news reports and a drug company sales representative in every physician's office in a matter of hours. Countless individuals will be denied details about this potentially life-extending food choice, because it is not a processed, refined or prepackaged menu item that manufacturers can manipulate for grossly obscene profits. In fact, processing nuts by roasting and flavoring with salt and other chemicals neutralizes the health benefits reported in this study. A group of researchers from the Dana-Farber Cancer Institute, Brigham and Women's Hospital, and the Harvard School of Public Health have published the results of a study in the prestigious New England Journal of Medicine that explains how people who ate a daily handful of nuts were 20 percent less likely to die from any cause over a 30-year period than those who didn't consume nuts were. As an aside, regular nut-eaters were found to be more slender than those who didn't eat nuts, a finding that should alleviate the widespread worry that eating a lot of nuts will lead to excess weight gain. To conduct this research, scientists examined an immense cohort from two large, well documented, long-running studies including 76,464 women from the Nurses' Health Study conducted between 1980 and 2010, and the Health Professionals' Follow-up Study including data on 42,498 men from 1986 to 2010. Participants in the studies filled out detailed food questionnaires every two to four years. With each food questionnaire, participants were asked to estimate how often they consumed nuts in a serving size of one ounce. Researchers found that individuals who ate a serving of tree nuts less than once a week had a 7 percent reduction in mortality (tree nuts included walnuts, hazelnuts, almonds, Brazil nuts, cashews, macadamias, pecans, cashews, pistachios and pine nuts). Those consuming a serving once a week experienced an 11 percent reduction; two to four times per week, a 13 percent reduction; five to six times per week, a 15 percent reduction; and seven or more times a week, a 20 percent reduction in death rate. Risk reductions were seen across a number of potentially fatal chronic illnesses, including cancer, heart disease, stroke and diabetes, as the scientists attributed lower death rates to an improvement in cholesterol ratios and reductions in oxidative stress, inflammation, adiposity and insulin resistance. The lead study author, Dr. Charles Fuchs, concluded, "The most obvious benefit was a reduction of 29 percent in deaths from heart disease, the major killer of people in America. But we also saw a significant reduction, 11 percent, in the risk of dying from cancer."